Flies are nuisance insects that have existed for thousands of years. Flies, such as the common house fly, are classified as filth flies as they typically breed in garbage, manure, and rotten food. This means that they can affect your health and well-being via the diseases they can transmit. Fruits flies, flesh flies, small flies, etc., have a quick maturity rate and that’s why they can cause a serious fly problem within a short period of time. Sightings of maggots: Could indicate a potential breeding site on your premises. Check out waste areas and look out for any signs of decomposing food. You regularly see flies: These sightings could include large number of flies buzzing around the base of wheelie bins, refuse areas or even guttering. At this stage, you might already be facing a serious fly infestation. Dark clusters of pinhead-sized spots: These spots can be found on wall surfaces, drainage channels, sub-floor cavities, below damaged floor tiling, light fittings, and more. Use general fly/pest control products: If your fly problem is small, you can use products such as fly traps, fly baits, fly light traps, insecticide dusts, and more. Use a moderate amount of water for indoor potted plants: Avoid over-watering your indoor plants because overly soaked soil provides an ideal breeding area for gnats. Make sure your pots are well-drained as well. Always pick up pet waste: Pet waste contains has the perfect moisture content for flies to breed and lay eggs. Keep your indoor and outdoor dumpsters and garbage cans clean: Make sure lids on garbage cans can still close tightly and surrounding areas have no waste spillage. Good to keep these cans as far away from doors as possible. Will I get bitten by flies? 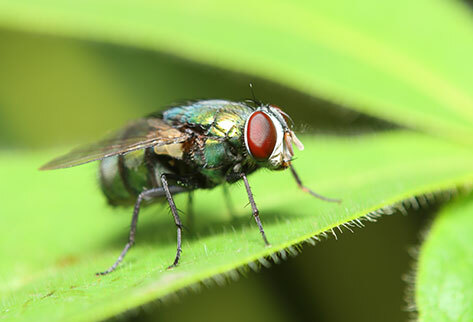 Common flies don’t usually bite, but there are other variations of flies such as black flies and horseflies that do bite humans. An interesting fact is that not many people know that mosquitoes are considered a type of flies so they certainly bite! I have an annoying problem with small flies that tend to hang around all summer and even into the warmer part of fall. What should I do? These could be drain flies so you might want to ‘close’ your drains by taping them with clear tape. If you see flies getting stuck to the bottom of the tape, you might have a fly infestation in the drains. I would like to know more about the diseases that flies carry. Can you tell me more? Flies are important disease vectors that can spread pathogenic microorganisms such as E-coli, typhoid, salmonella, dysentery, and more. This happens because they are in frequent contact with carrion and/or dung. Need Help with Flies Control Today? PEST is Green Shield Certified and is the fly control expert you can trust. Our team has extensive experience in treating fly infestations and utilizes state of the art equipment to get the job done. We are able to accurately identify the species of fly that is infesting your area and their breeding site(s). Our solutions are safe and efficient, and we can ensure your fly problem gets fixed for good in no time. Looking for a professional solution to your fly problem? You can contact PEST by sending an email to info@pesteliminationsystems.com or call us at 212.945.0868.